I had all these grand plans of cute summery outfits that I could take pictures of and post about. Unfortunately it rained every single day. So my week was spent in boots and hoodies, with ruined rain soaked hair. Luckily I had a manicure booked in Thursday lunchtime to look forwards too. I chose OPI's You Don't Know Jacques. I am actually going to buy this shade. I'm in love. What do you have on your nails? That is a pretty colour. That is such a stylish colour. I am about to do my nails in about 5mins actually. Will probably be pink or maybe gold. Love OPI also. I know exactly how you feel - summer abruptly ended this week and it actually stormed so bad we lost power for close to a full 24 hours. Definitely not a good time for nice hair or outfit photos. 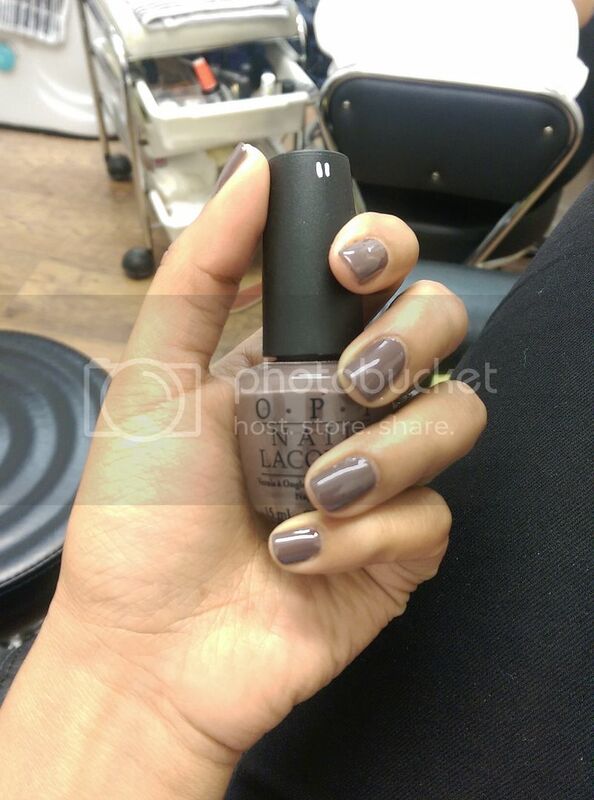 I love the OPI collection this shade comes from, You don't know Jacques is such a great colour and there was another one... I can't remember the name right now. But lately I've been wearing Essie's Minimalistic non-stop, it's the perfect pale pink. Great, classic shade. Now let's see some nail art!